In Never Neverland Peter is now towards getting 80 years old and thought that he would never get old. He thought that he’ll never grow up and stay a little kid forever. There he is in his home looking all glum that he can’t play anymore and all the lost boys are with their parents. Tinker Bell is dead and he can’t find any companions to play with forever. He only has the island he loves so much and pretends to play with food. But, the mermaids he always saw were still there, but now old as he is. He knew at some time he’s going to die and wonder if God will ever receive him in Heaven. Wendy and her brothers are now married and have jobs. But, when Peter Pan became old his long time friends, like Wendy, John and the others are now dead, but their kids and nephews are still living in a normal world. This isn’t what Peter wanted and he believes in the Fountain of Youth, but doesn’t know where it is. Poor Peter Pan, and for sure that God will receive him in the Heavens. Why not? He rescued Wendy, her brothers, and the lost boys from Hook and his goon pirates. 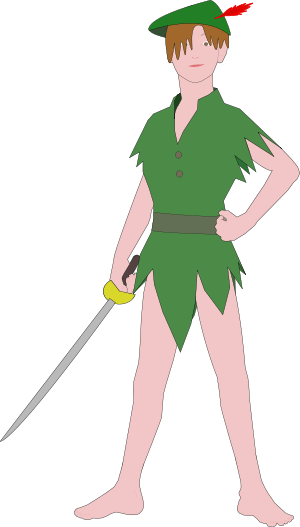 Once he’s with the same suit that made him the famously known Peter Pan is now wearing off and no longer could do the things he could’ve done when he was a boy. Well, that day Peter Pan died of natural causes and met Jesus alongside with God in his place. Jesus created Peter’s own version of the Never Neverland island and Peter Pan was so thrilled that he hugged Jesus thanking him for this favor. Well, the real Never Neverland is soon now deserted and now belongs to the mermaids. But, they can’t get out of the water, because they only live underwater. The place was truly deserted and has no living beings on the island grounds. Peter Pan sure hoped there would be new lost boys, pirates to fight with, and someone like him as well. He truly cares about Never Neverland and the people in it. But, once he’s with God in Heaven he could no longer save the place. But, he lived happily for it’s what God wanted for him.